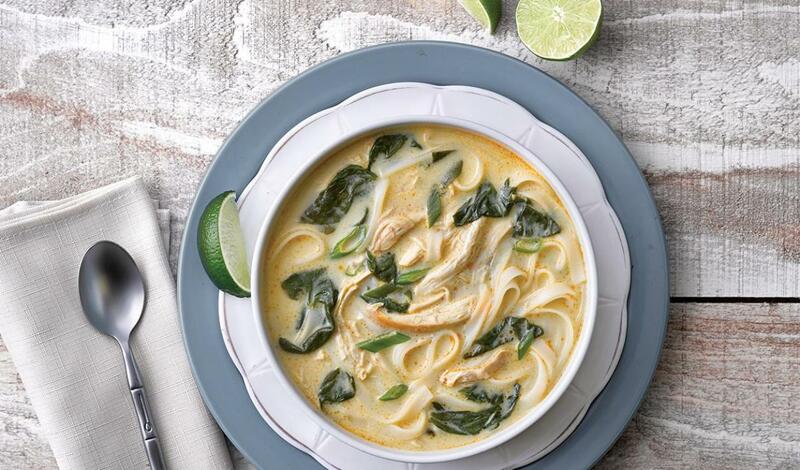 Coconut milk, lemongrass, red curry and ginger add a little heat to this fragrant classic chicken noodle soup. In a large soup pot, over medium-high heat, combine prepared chicken base, coconut milk, lemongrass, red curry paste and ginger slices. Bring to a boil, reduce heat and simmer for 30 minutes. Strain the liquid and return the broth to heat. Add cooked chicken meat; simmer for 5 minutes. Remove pot from heat; add noodles, cover and let sit for 5 minutes. Add lime juice and scallions. Stir in baby spinach. Reserve warm. Ladle soup into bowl. Garnish with cilantro leaves and lime wedge.